Search for all "VEGFR-3 / Flt-4"
Rabbit anti Human VEGFR-3 / Flt-4. DNA immunization. 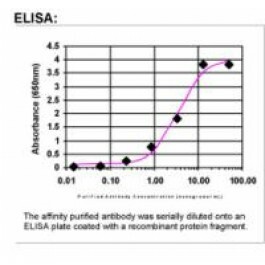 This antibody is specific for the Middle Region of the target protein. Vascular endothelial growth factors (VEGFs) are a family of closely related growth factors having a conserved pattern of eight cysteine esidues and sharing common VEGF receptors. VEGFs stimulate the proliferation of endothelial cells, induce angiogenesis, and increase vascular permeability in both large and small vessels. The mitogenic activity of VEGFs appears to be mediated by specific VEGF receptors. VEGF Receptor 3 is one of the five receptor tyrosine kises (RTKs) (VEGF Receptor 1/Flt1, VEGF Receptor 2/KDR/Flk1, VEGF Receptor 3/Flt4, tie1 and tek/tie2) whose expression is almost exclusively restricted to endothelial cells. 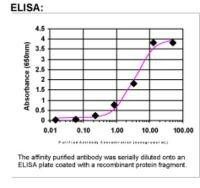 The fragment used for D immunization was expressed in E.coli and the purified protein fragment was used for affinity purification of the antibody. 20 mM Potassium Phosphate, 150 mM Sodium Chloride, pH 7.0.